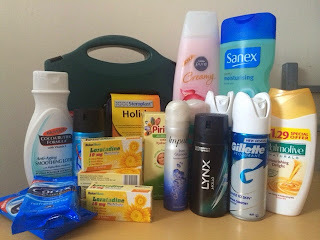 As an online shopper I was ever so delighted to shop at Chemist Direct, Chemist Direct has over 20,000 products,their range includes health and beauty products, as well as pharmaceutical and prescription items. I found the Chemist Direct website really easy to navigate, with easy to follow sub menus is was quick and simple to located your desired product. Chemist Direct have regular promotions and price cuts on various products which is a fantastic bonus, as well as every kind of health care product you and your family could possibly need. My best buy defiantly is these Hayfever tablets which were only £4.48 for 6 boxes of 30 tablets. I was delighted at the price as they are very much needed in our home. I was also very pleased to find this brilliant and very much needed first Aid Box, I have been wanting one for ages, so I was really pleased I found it and at only £7.79. I loved that I could order all of the the items I needed and within a couple of days my parcel arrived at my home, the prices were amazing and I loved the fact you are offered free postage if you spend more than £40. Chemist Direct also offer an online consultation and prescription service which is great, I would defiantly use this service in the future. Chemist Direct is UK based registered pharmacy this means all of their products and services and practices are monitored just like your high street pharmacy. My online shopping experience with Chemist Direct was a very pleasant and very enjoyable one, I look forward to shopping with them again. I was given a Voucher code to help me review the products and services. All thoughts are honest and of my own opinion..